Picture from Confessions of a Homeschooler. Blog planners are perfect for helping me to organise and schedule posts, and now that I'm trying to balance working and blogging more they are pretty much essential! 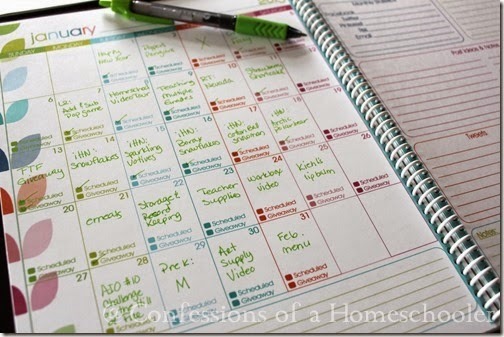 Now, I could just go out and buy a cheapy diary to use as a planner but I recently came across this free printable blog planner for 2015 from Confessions of a Homeschooler and I love it! It has monthly calendar pages as well as separate pages to note down monthly statistics, post ideas and notes, tweets, pinterest pins and more. Plus there are separate pages to keep a record of blog advertising, giveaways and brainstorming and ideas. It's lovely and colourful and so useful for tracking scheduled posts. There is also a separate download for a weekly blog planner in case anyone wanted to download that. After I downloaded the planner I printed it double sided (I skipped out a few of the blog advertising and giveaway pages to save on printing!) and stapled it all together. Obviously you can take it to a shop and get it spiral bound and add a plastic cover if you wanted to turn it into a proper notebook or planner but I was quite happy to staple mine to save on money! A huge thank you to Erica from Confessions of a Homeschooler for making this! Do you use a blog planner? What are yours like?